FiinPro - VPBank Debuts at VND39,000/Share, Cheap or Expensive? VPBank Debuts at VND39,000/Share, Cheap or Expensive? VPBank floated 1.33 billion shares on HOSE today August 18 with the debut price of VND39,000 per share, the highest level among those of 15 banks currently listed on HOSE, HNX and UPCom. VPBank's capitalization is around VND51 trillion ($ 2.3 billion), still ranking behind Vietcombank, BIDV and Vietinbank, but higher than MBB and VIB. This price is based on the reasonable price that VPBank's listing advisory company – VietCapital Securities JSC- valuing this bank according to the prospectus at VND40,108/share. Ban Viet used two basic methods of comparison of PE (price-to-income) and PB (price to book value) with 6 other banks BIDV, Vietcombank, Vietinbank, ACB, MBBank and VIB to determine the price. However, the comparison of PE and PB of VPBank with those of the listed banks, according to our data, investors should be considered more thoroughly due to the influence of FE Credit. This consumer finance company now accounts for 22% of VPBank’s total outstanding loans and 51% of VPBank's total profit for 2016. VPBank still maintains retail banking like other banks in the market. Therefore, VPBank's valuation needs removing consumer finance sector through FE Credit when it is compared with other banks. 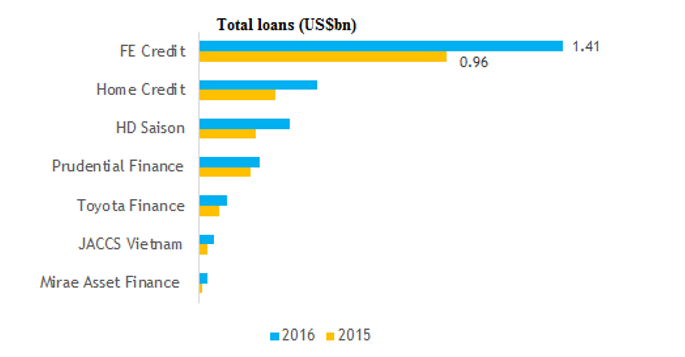 The value of FE Credit can be reasonably determined through recent M&A deals with consumer finance companies such as Credit Saison investing 49% in HDFinance and some other deals that foreign companies invested in financial companies in Vietnam. Through this method, according to the writer’s calculations, FE Credit can be valued at around $ 1 billion, based on the size of the loan portfolio and the price/equity ratio. However, FE Credit may be priced higher due to the residual valuation of FE Credit's position and fundamentals as well as the bad debt risk. This means that VPBank's valuation is about $ 1.4 billion, equivalent to around VND22,500 per share. Then its PE is 15.5 times and PB is 2.1 times. Compared with the listed banks, VPBank's valuation indicators are closer and more reasonable. However, what investors are more interested in is after the listing, how VPBank share price will move. Since the beginning of the year, prices of banking stocks have increased sharply and generated an average increase of 22% for this sector. MBB share price has increased 78% and SHB share price has added 68%. This means that the potential for further upswing of banking shares is not high in the short term. The key point to note is VPB's Net Interest Margin (NIM) declined in Q2/2017. Except MBB, our data indicates that NIM and net profit of some banks also showed signs of mitigation. Vietinbank for example, if the extraordinary profit of VND200 billion is removed, Vietinbank’s profit in Q2/2017 did not increase much year-on-year while the size of its outstanding loans increased sharply at the average market pace. This may be a sign that banks have invested in government bonds, including some very long terms ranging from 15 to 30 years which previously are interested by insurance companies only. It can be commented that banks need to disburse capital to certain profitable areas in their lending activities that are not yet able to grow rapidly in a sustainable way to keep the NIM and ensure 2017 profit target. The data in the article is provided by FiinPro Platform of StoxPlus. We are step by step building an independent data analysis team to make full use of the data provided to our customers through FiinPro to help them get truly independent and insightful view based on comprehensive database of FiinPro and of StoxPlus in general. This is one of the initiatives as a part of StoxPlus' new mission to "Enlighten the Market".